Willow the Barn Owl, flies over a crowd of photographers during our semi-annual photography event for professionals and amateurs. Photo by Rosie Casper Hinkle. Owls and eagles and hawks, OH MY! These birds are ready for their close-up. 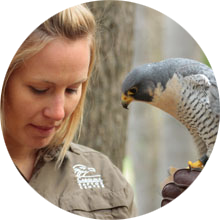 Our resident raptors are ready for close-ups, action shots and more as PhotoWild approaches once again. Whether you’re an amateur or professional photographer, come out and enjoy this opportunity for a professional photo shoot featuring more than 20 of our resident raptors. 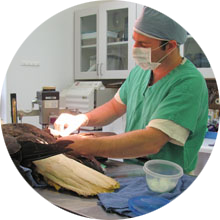 Each day begins with an early-bird breakfast followed by six, 30-minute sessions with the birds. 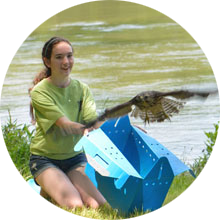 The final hour of each day features free flight performances of Carolina Raptor Center’s flight show superstars. 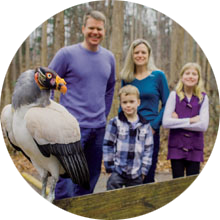 PhotoWild is limited to a minimum of 10 participants and a maximum of 30. Reservations are required at least four weeks in advance. To get weekend pass pricing option, please click on links above and follow the instructions. ** Discount applied by using promo code associated at check out - only for booking weekend passes. For questions, please contact our Program staff at (704) 875-6521 ext. 210 or programs@carolinaraptorcenter.org. To make a payment over the phone, please contact our Visitor Center at (704) 875-6521 ext. 107.